In my last article I proposed a matrix mixer suitable for DEM. Here I will take a look at those mixers that already exist on the market. The main criteria for a device to make this list is that it is affordable and compact. Certainly there are studio-quality matrix mixers, from companies like Allen & Heath. But these range in price up to $4000. That's a different domain! Imagine any possible signal generation or processing task and you can find a modular synthesiser unit that does what you want. In a very real sense, modular synthesisers are a superset of all other audio. But a reasonably capable kit is expensive, power-hungry, and bulky, once you've assembled a dozen or more modules in a case. 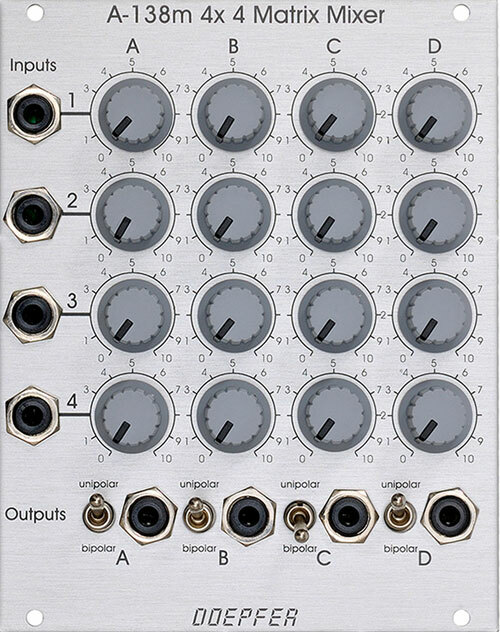 Doepfer has a matrix mixer in the popular Eurorack format. It's a four-by-four configuration that is designed for both audio signals and control voltages. As such, it has a distinctive feature that puts a column into bipolar mode, where the signal can be subtracted from the output. The cost is a very reasonable €140. Like most modular units, the connections are mono jacks, directly on the front panel. If you wish to build a mixer yourself, you can burn a PCB, purchase the components, and follow Ken Stone. This popular design is five-by-five, with a bipolar switch on every connection. Here's a later four-by-four design. Elby Designs has followed Stone with a four-by-four mixer, the CGS733, part of their Panther project. Around the web one will find various people who have made their own passive matrix mixers. Examples include Mickey Delp and Giacomo Bisaro. Xiwi Electronics once offered a four-by-four kit. Brendan Byrne demonstrates the possibilities of feedback using this unit. An inexpensive three by two passive mixer is available from Handmade Electronic Instruments, but it's mono and works with jack inputs. The MiniMON matrix mixer has a heterogeneous collection of RCA and jack connectors. The controls are far from straight-forward, as its designed for studio monitoring duties rather than line mixing. Near as I can tell, this is the sum total of available options. None of them offer stereo connections on minijack. Though it would be easy enough for an electronics guru to reconfigure the DIY options for that wiring, there are no off-the-shelf products. From this I conclude that there is a gap in the market for my DEM matrix mixer.